U.S. gold futures closed to a fresh record on Friday after falling for two straight sessions. Gold prices surged 1.9 percent higher on the week, supported by safe-haven buying as day after day unfolded without a resolution to the U.S. debt ceiling. "The economy is weak, and these guys in Washington are playing chicken with the debt ceiling," Matt Zeman, a strategist at Kingsview Financial in Chicago, said in a telephone interview that was relayed on Bloomberg. "It’s not a good mix, and gold may be one of the safe harbors that people find." December gold prices advanced $15.00, or 0.9 percent, to a record close of $1,631.20 an ounce on the Comex in New York. Gold traded between $1,613.00 and $1,637.50 — an intraday record as well. According to market analysts, also supporting gold was a U.S. Commerce Department report which showed anemic growth during the first half of 2011. "The weak economic data suggests that you may see some form of stimulus, certainly highly accommodative monetary policies, and that will continue to put a bid on gold prices," Mark Luschini, chief investment strategist of broker-dealer Janney Montgomery Scott, said and was quoted on Reuters. "As long as there is no re-normalization of a steady state of economic or fiscal circumstances, gold will move higher." Gold prices rallied $128.40, or 8.5 percent, in July and 14.8 percent in 2011. Forecasts are mixed on gold’s direction for next week, according to Kitco Metals Inc’s weekly gold survey. "Participants in the weekly Kitco News Gold Survey are almost equally torn about the direction of next week’s gold trade as the talks about raising the U.S. debt ceiling are dragging on longer than what most people expected. That said, the bears slightly outweigh the bulls, but there are a fair number of participants who said they are on the sidelines until a decision has been made in Washington. In the Kitco News Gold Survey, out of 34 participants, 24 responded this week. Of those 24 participants, eight see prices up, while 10 see prices down, five are neutral and one sees prices sideways or unchanged. Market participants include bullion dealers, investment banks, futures traders and technical chart analysts." September silver prices gained 31.2 cents, or 0.8 percent, to $40.106 an ounce. Silver ranged from an intraday low of $39.300 to a high of $40.410. The metal was nearly unchanged for the week, coming in with a loss of 2 cents. Silver prices soared $5.27, or 15.1 percent, in July and have gained 29.6 percent in 2011. Platinum prices for October delivery declined $7.10, or 0.4 percent, to close at $1,785.30 an ounce. Platinum traded between $1,779.00 and $1,795.10. Prices dropped 0.7 percent this week, but they rose 3.4 percent for July and they have gained 0.4 percent in 2011. Palladium prices for September delivery retreated 40.0 cents to settle at $827.70 an ounce, ranging from $820.55 to $833.30. The metal surged 2.6 percent for the week and 8.8 percent for the month of July. Palladium has gained 3.0 percent in 2011. Palladium declined $5.00 at $824.00 an ounce. 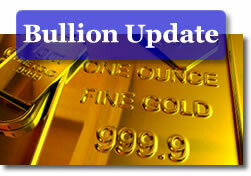 Weekly gains included 1.7 percent for gold and 2.1 percent for palladium. Losses included 0.1 percent for silver and 0.8 percent for platinum. London metals surged for the month of July, registering gains of 8.2 percent for gold, 13.2 percent for silver, 3.3 percent for platinum and 8.3 percent for palladium. Historically, demand for U.S. Mint American Eagle coins tends to slow in summer months. Based on this week’s Eagle performances, the slowing trend was true for the American Silver Eagle bullion coin but not for the companion American Gold Eagle. Despite a weekly level that ranks among the lowest of the year, the American Silver Eagle coin topped 25 million in year-to-date sales. The bullion Silver Eagle sales pace remains handily on track to smash last year’s annual sales record of 34.6625 million. In a less rosy picture, United States Mint authorized buyers scooped up "just" 399,000 this week, which is less than half of the amount registered in the previous week. The Silver Eagle could potentially record its worst month this year. Current July sales are at 2.716 million (the Mint has not officially closed out July). That is below the 2.767 million mark registered in March, which currently holds the lowest monthly sales title in 2011. On the flip side, demand for the one-ounce American Gold Eagle bullion coin shot sharply higher. The 22-karat gold coin rose 2,500 for the day and 24,500 for the week, which easily surpassed the previous weekly gain of 15,500. July sales stand at 61,500. That is higher than last month’s 56,000. *The Gettysburg and Glacier America the Beautiful Five Ounce Silver Bullion Coins are sold out. The United States Mint does not provide daily per coin sales totals for the Olympic, Vicksburg, and Chickasaw America the Beautiful Five Ounce Silver Bullion Coins as it does for its other investment-grade products. The individual numbers above are as of Wednesday, July 27.